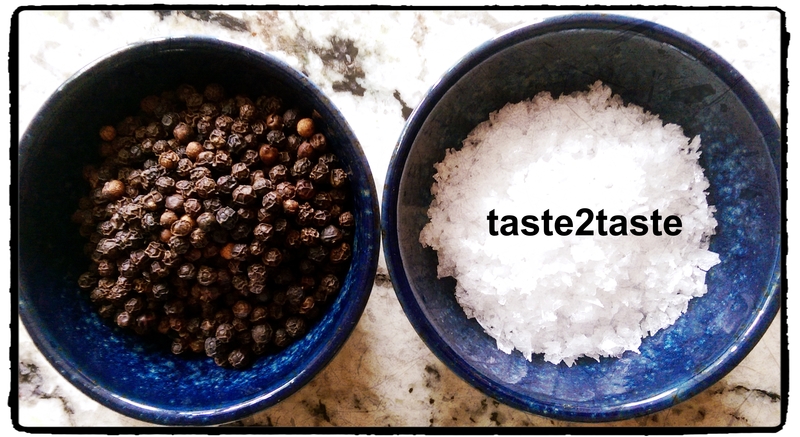 I have had so much fun combining my birthday celebrations with some amazing foodie experiences. 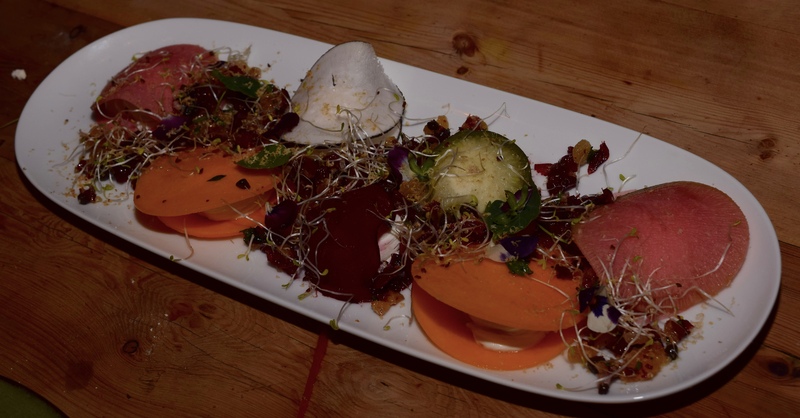 I wanted to share my long anticipated visit to the Chef’s Table at Parlour, Kensal Green, London NW10 5LG that I had booked two months previously. 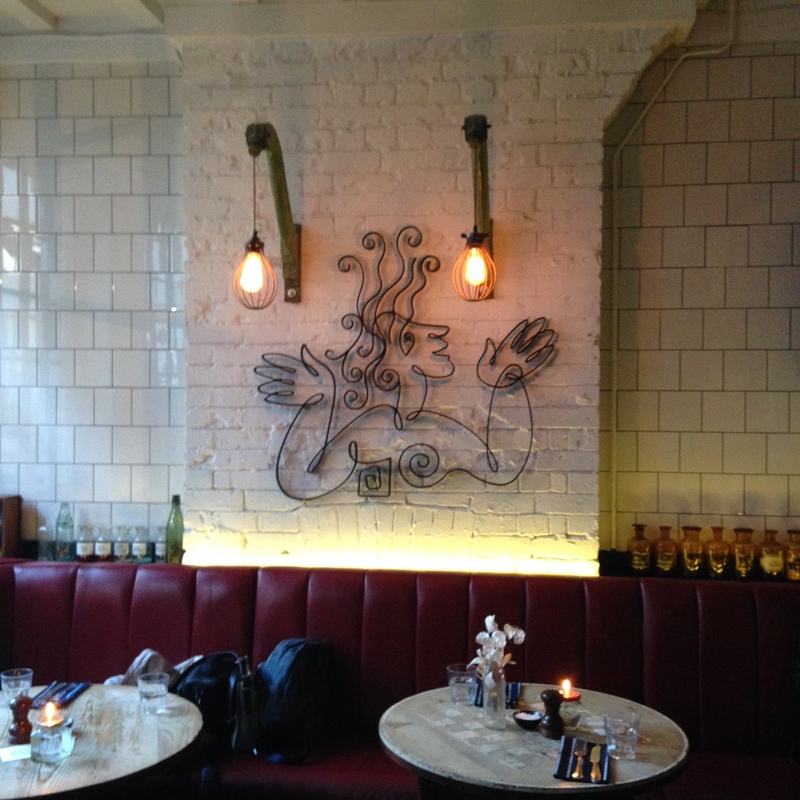 The restaurant has a cool gastropub decor & vibe in a converted Victorian pub with some funky artwork designed by head chef’s Jesse Dunford Wood’s Dad. We knew we were in for a treat when Jesse, the owner, head chef & host introduced us to the whole Chef’s Table experience. He was such an engaging host – a combination of ringmaster & raconteur – stories delivered with fun, humour & a touch of the Willy Wonka ( more of that later). The evening started with a swish & pop- namely sabrage – the technique that uses a special sword to remove the cork & top of the bottle of Prosecco which Jesse expertly did. We then toasted my birthday with a selection of sparkling cocktails. Then followed a selection of delicious and eclectic starters to share, that were innovative, creative & tasty, each introduced with an accompanying story of their creation. 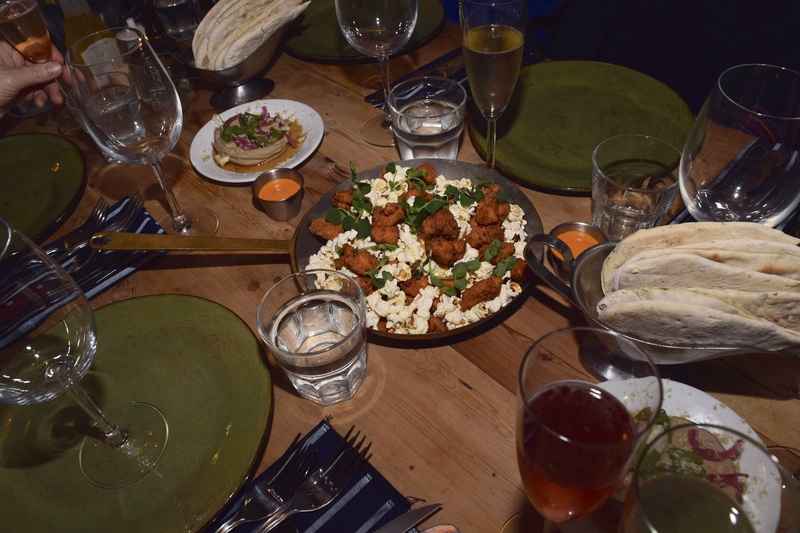 We tucked into chestnut hummus with rosemary pitta bread, McTucky’s Popcorn chicken nuggets with actual popcorn, pistachio topped duck liver profiteroles with blood orange chutney, home smoked salmon with home made soda bread, raw vegetable goats cheese ravioli. 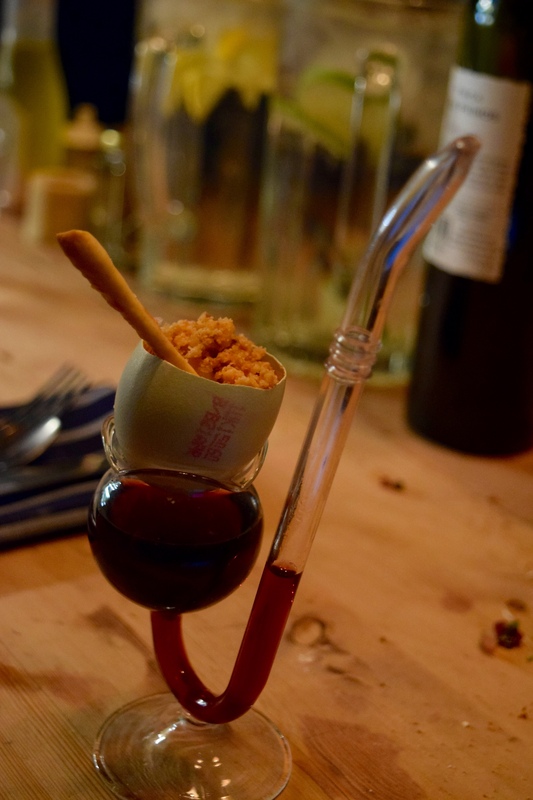 We had steak tartare with rye crisp crackers and stilton savoury custard topped with hazelnut crumble served in an egg shell with home made grissini to dunk in the funkiest holder I’ve ever seen! Stilton Savoury Custard with the coolest egg cup holder! The glass had a reserve of wine beneath & a spout so you could sip the Argentinian Malbec whilst enjoying the rich custard. 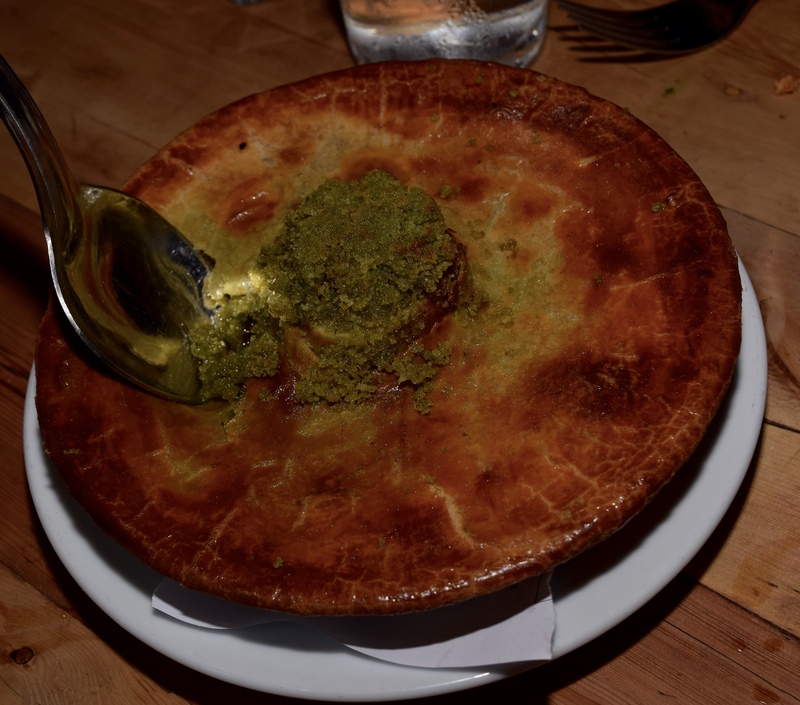 Main Courses included the famous Chicken Kyiv – crisp, golden & spherical and the famous Cow Pie, with stuffed marrow bone in the centre, served with sides of creamy mash & cabbage. 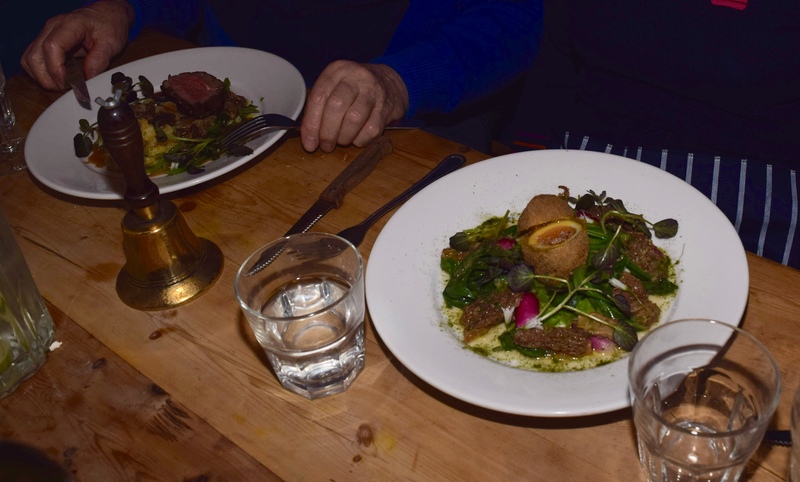 We also had some beautiful lamb, cod, sea bream, duck & scotch egg. 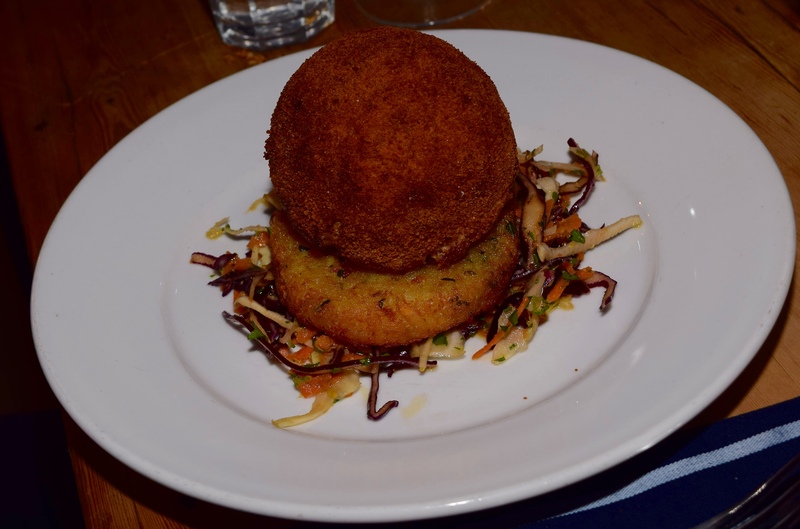 L – R: Lamb & Duck Scotch Egg Mains + Bell – just ring to swap! Jesse kept reminding us to pace ourselves with some great references to Monty Python’s “Meaning of Life”. After a welcome break we were then handed headphones, and watched in amazement as the spectacular dessert was assembled to music before our eyes. A fabulous Willy Wonka -esque experience and the picture at the start is only a little taster to whet your appetite. We had an enormous selection of desserts including toasted marshmallow wagon wheels, macarons, arctic roll in funky flavours, souffle ( with birthday candle) and lots more fabulous sweet delights. There were a few other exciting things but rather than share them I really urge you to experience for yourself, either in the main restaurant or at the Chef’s Table. 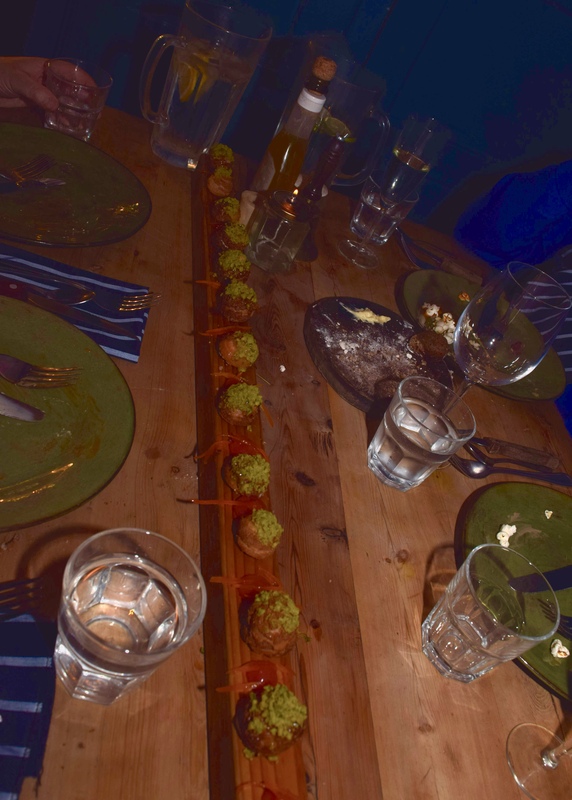 A fabulous, foodie, quirky, creative experience which we all thoroughly enjoyed. So thanks to Jesse and his team for a fantastic birthday party at Parlour. Hello could you give me details of the tasting menu and prices please? Hi Martine you can book via phone or their website. Bookings are taken 8 weeks ahead and Chef’s table is only available Tuesday- Friday not at the weekend ( the restaurant is closed on Mondays & main restaurant is open Tuesday- Sunday).The chef’s table is up to maximum of 8 people. The area is quite snug so depends how many in your party & how comfortable . I recommend going with a group as the food experience involves sharing especially the starters & dessert. The price for dinner is £70 or lunch at £50 per person for all food, a cocktail & drinks with service included in the price. We went for dinner and thoroughly enjoyed it & thought great value for money too. If you like casual dining with lots of fun in a pub dining setting I definitely recommend. Enjoy!